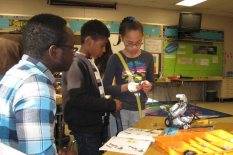 Malick Diarra works with students at Greenbelt Elementary School on building robots. The University's College Park Scholars Science, Technology and Society (STS) Program, sponsored by the A. James Clark School of Engineering has grown accustomed to receiving requests for partnerships involving UMD students, tours of robotics labs, and teacher training opportunities from local schools and youth groups. As an individual who is connected to many UMD students who study fields related to robotics—many of whom have grown up on robotics teams and participated in robotics camps—Aruch began his work with Mendelsohn to create a service-learning program enabling UMD students to teach robotics to youth in grades K-12. The community of undergraduate students who participate in the College Park Scholars residential living-learning programs served as the ideal pool from which to draw students for the robotics after-school program. STS attracts about 75 freshmen per year. Aruch now offers Scholars a 1-credit robotics service-learning course that is supported by the Office of Undergraduate Studies and the Office of Diversity and Inclusion's Moving Maryland Forward campus grants program. Annually, around 50 undergraduate students participate in the course, each spending two weeks at the beginning of the semester learning about Science, Technology, Engineering, and Mathematics (STEM) education, pedagogy, and classroom management techniques. Then, equipped with their newfound learning and Lego robotics kits, the UMD students are then driven by undergraduate teaching assistants to local public schools to teach youth how to build robots. Local public school teachers and administrators have found their students fascinated by the chance to work with college students to build and program machines that respond to touch, voice, and other actions. “The experience of building a robot, programming it, and making it move is something that a regular science class will not be able to offer,” said Elizabeth Butler, chair of the Science Department of Martin Luther King, Jr. Middle School in Beltsville, MD. Since the program was piloted in Fall 2011 at Northwestern High School in Hyattsville, it has expanded to five schools within a 10-mile radius of the University campus: Hollywood Elementary School, Greenbelt Elementary School, Martin Luther King, Jr. Middle School, College Park Academy, and Eleanor Roosevelt High School. The program has grown from working with about 50 students per year to more than 200. In addition to the program's local activities, Aruch led a group of UMD students on a visit to Ecuador during the Winter 2014 semester, where the team ran robotics workshops in rural, indigenous Ecuador, thanks to a donation by Lego Education. Aruch, a Ph.D. student in the College of Education and former Alexandria Public Schools science teacher, says the next step for the program is to turn it into a three-credit General Education Scholarship in Practice course or I-Series Course. He is exploring the possibility of cross-registering the course with the College of Education. Aruch would also like to engage participating schools in campus visits where they can learn more about STEM-related subjects. Other opportunities for growth include offering professional development workshops for teachers, supporting robotics clubs in schools outside the program's radius, and participating in STEM-related research grants, which often have education and outreach components. These types of efforts, he hopes, will attract more students on campus and help expand the program to reach more students, both undergraduate and K-12.